Banned and Recovered: Artists Intervention traveled to three venues between the dates of September 2010 and October 2012, including the Reese Bullen Gallery at Humboldt State University, the University of California, Merced’s Kolligian Library, and the National Steinbeck Center in Salinas, CA. The exhibition featured works inspired by books that have been challenged and banned in U.S. schools and libraries and also addressed the real threats to the U.S. Constitution posed by the 2003 U.S. Patriot Act. Approximately 10,000 visitors enjoyed the exhibition while it was on tour. 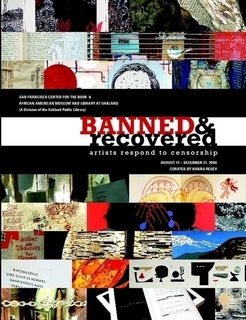 Inspired by the exhibit Banned and Recovered: Artists Respond to Censorship, which was on display at the San Francisco Center for the Book and the African American Museum and Library in Oakland in 2008, Curator Hanna Regev sought out contemporary Bay Area artists to contribute to a similar traveling exhibition. Artists contributed works inspired by 36 titles on the long list of banned and challenged books. “Burning Books: The Extreme Ban” demonstrated that book burnings and the persecution of authors are pervasive, a global phenomena, and an assault on civilization. Artist contributions included original book art, mixed media pieces, paintings, photographs and multi-media pieces. An audio guide, which included chapters by the curator and multiple contributing artists, was also available to the public as a component of the exhibition. An exhibition catalog is available at www.lulu.com. An interactive website, with information about the artists, pieces of art and exhibition will be continue to be available at: www.bannedandrecovered.org. The Steinbeck Center hosted a gallery talk and tour with the curator of the exhibition, Hanna Regev, and three contributing artists, Enrique Chagoya, Kara Maria, and Salinas native José Ramon Lerma. The artists discussed the inspiration behind their pieces, and as noted by Deborah Silguero, Curator of Exhibitions and Collections, the conversation became quite heated, which “made it more fascinating for the patrons.” The exhibition of Banned and Recovered also led to a new partnership between the Steinbeck Center and the Monterey Public Library, which co-hosted the exhibit. A reception was hosted by Exhibit Envoy in October 2012 to thank the artists and Regev for their contributions. Hosted by Penny Nii at her home in San Francisco, the event featured a silent auction where some of the exhibit artists generously contributed artwork for sale. The exhibit continues to draw attention. Curator Hanna Regev and three contributing artists, Milton Bowens, Mary V. Marsh, and Jan Wurm, were invited to participate as a lunchtime panel at JFKU. Regev provided background on challenged books and the artists discussed the the books that inspired their artworks and shared their thoughts on censorship and freedom of expression.